The blind spot monitor is a vehicle-based sensor device that detects other vehicles located to the driver’s side and rear. Warning can be visual, audible, vibrating or tactile. This feature will warn if a car – sometimes other objects – is in the driver’s left or right blind spot. A warning will appear in the side view mirrors or in the windshield frame. Some advanced versions of this feature may give an audible warning if the driver uses their turn signal and there is a vehicle in the blind spot. The feature uses sensors that are always monitoring the road to the driver’s sides. They are optimised to work at highway speeds. Advanced features will work with the turn signal to provide the driver additional warnings if the driver attempts to change into a lane where another car is right next to theirs. However, blind spot monitor is an option that can do more than monitor the sides and rear of the car. It can also include Cross Traffic Alert, which alerts drivers backing out of a parking space when traffic is approaching from the sides. Different brands have different names for this feature. For instance, Volvo developed Blind Spot Information System (BLIS), a system of protection that was first introduced on the redesigned 2007 Volvo S80 sedan and produced a visible alert when a car entered the blind spot while a driver was switching lanes. Mazda was the first Japanese automaker to offer a blind spot monitor which they refer to as BSM (Blind Spot Monitoring). 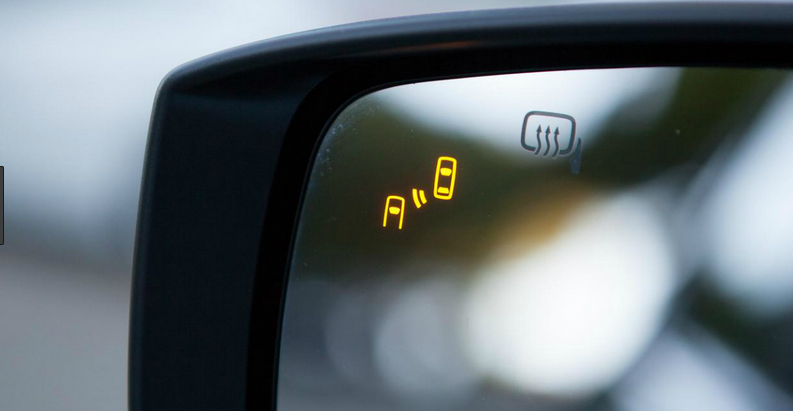 Mitsubishi offers a Blind Spot Warning (BSM). In 2010, The Nissan Fuga/Infiniti M for the first time offered counter steering capabilities to keep the vehicle from colliding, calling this Blind Spot Intervention.